Usually, the two eBGP speakers are directly connected (for example, over a Wide Area Network (WAN) connection). Sometimes, they cannot be directly connected, such as the case when a router that does not use BGP is in between the two neighbors that wish to form an eBGP neighbor relationship. In this special case, the neighbor ebgp-multihop router configuration command is used. Without this command, an eBGP neighbor relationship with a non-directly connected neighbor will never form. Remember, this command is only used with eBGP, not iBGP. © 2002, Cisco Systems, Inc. All lights reserved. Look at the previous example where R5 is a non-BGP speaking router. R4 and R6 wish to form an eBGP neighbor relationship. Notice that both routers reference their external neighbor by an Internet Protocol (IP) address that is not directly connected. A requirement of BGP is reachability, so an ebgp-multihop configuration must include static routes or must enable an IGP so that the neighbors can reach each other. 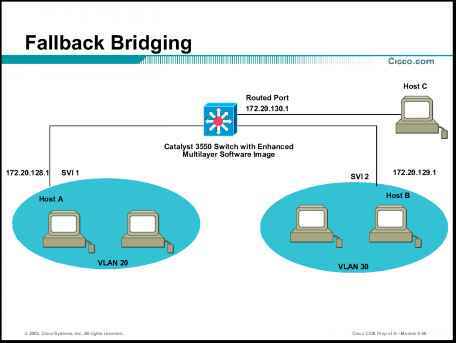 It is possible to have a situation where an ebgp-multihop router configuration is useful together with loopbacks. Using these two features enables you to perform load balancing between two autonomous systems over parallel links. The neighbor ebgp-multihop and neighbor update-source router configuration commands have the effect of making the loopback interface the next hop for eBGP, which allows load balancing to occur. You can use static routes to introduce two equal-cost paths to the destination. (The same effect could also be accomplished by using an IGP.) R4 can reach the next hop of 5.5.5.5 in two ways: via 172.16.44.5 and via 172.16.45.5. Also, R5 can reach the next hop of 4.4.4.4 in two ways: via 172.16.44.4 and via 172.16.45.4.